Who Has the Best Software for Plumbing Companies? Finding the Best Software for Plumbing Companies. It’s hard to believe that until very recently, plumbing companies — and all other home service companies — were operating without being fully computerized. They were using different programs for scheduling, another one for dispatching, another one for accounting, another one for inventory control, and yet another one for financial reporting. And none of those programs integrated which each other. The “old” system generated a lot a paperwork, there was much duplication and many errors, and it was difficult for a plumbing business owner to stay on top of every aspect of his business. Then along came field service management’s plumbing software. In the last few years, a number of companies have brought to market software that automates your business and makes things more efficient and easier for everyone in your company — including you. You can spend the next five years going through the features of each product on the market, or we can save you some time and have you take a look at FieldSurf, the best software for plumbing companies. FieldSurf totally automates and integrates every aspect of your plumbing business. It is Internet-based and can be accessed from any desktop computer, any tablet computer and even from a smartphone. FieldSurf automates your Dispatch and Scheduling, your GPS tracking of your techs in the field, it automatically generates an Invoice based on the Work Order, and then electronically sends the invoice to your customer. FieldSurf has integrated SMS text messaging, so everyone in your company can communicate with everyone else from the same platform. FieldSurf has geofencing, so you not only track all your techs in the field in real time, you are also informed when a tech leaves one area and enters another, and the location of each of your techs in the field can be pinpointed on FieldSurf’s GPS map. Financial accounting and reporting are a dream with FieldSurf. Your plumbing techs use FieldSurf to clock in and out of each job, and then to clock in and out at, the start and end of each working day. This makes the calculation of payroll a cinch. FieldSurf can even calculate any commissions owed to your tech. FieldSurf also calculates how much money you made on each job. Another huge feature of FieldSurf is it’s complete control of your Inventory. When new items enter your warehouse — water heaters, toilet systems, faucets or any other plumbing fixtures, as well as parts and supplies — each item is entered into FieldSurf’s Inventory module. When a technician takes an item out of your warehouse and places it in his service vehicle, FieldSurf notes that. Then, when your field tech sells the item to your customer, FieldSurf notes that the item has been sold, and deducts that item from your inventory on hand. When you reach a predetermined level of product, FieldSurf alerts you to reorder so you never run out of product. With FieldSurf, you always know – in real – time – exactly what’s going on with your Inventory. FieldSurf’s Inventory control capabilities alone make it the best software for plumbing companies. As a management reporting tool, there is nothing to beat FieldSurf. Whatever financial information you need about your company can be generated with a few clicks. FieldSurf lets you know your sales for the period and lets you compare those sales to sales from any other period. FieldSurf can tell you how much money you made on any job, and how much you owe your technicians for hours worked and will calculate any commissions due to your technicians. It can also tell you which of your plumbing technicians is doing well and making sales, and which ones may need more help and encouragement. And everything in FieldSurf is in real time. Your sales and financial reports can reflect transactions made today. Your Inventory reporting is real time. You can check on any job from any location and see if a job has been completed or if your tech is still at the customer’s location. You can check at any time and see which of your accounts have been settled and which accounts are still outstanding or even past due, and you can instruct your Accounts Receivable people accordingly. Another reason why FieldSurf is the best software for plumbing companies is its integrated SMS texting capabilities. everyone in your company can use FieldSurf to communicate instantly by SMS texting with everyone else in the company. 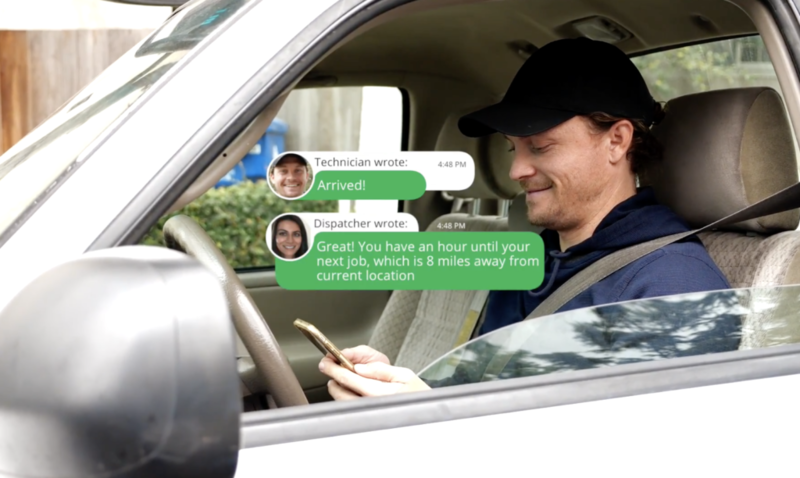 Your dispatcher uses the SMS feature to text your field techs about new job assignments and any changes in the customer’s schedule. Supervisors can reach your techs in the field with instructions or advice. FieldSurf has a unique feature called “geofencing” which allows you to set up virtual boundaries around real physical boundaries. So you can set up to be notified the moment your plumbing tech leaves Beverly Hills and enters West Hollywood. You always know where he is at all times, and can reach him anywhere. There are a lot of different companies out there marketing field service management software. But you don’t need to look any further than FieldSurf if you want to get the best software for plumbing companies. FieldSurf is easily the most versatile and full-featured field service management system on the market. It is 100% Internet based, so there’s no software to download or install. FieldSurf is easy to learn and easy to use – you can be up and running the day you register your company and your field techs with FieldSurf. And if you’ve been using Quickbooks until now, you will be thrilled to note that FieldSurf integrates seamlessly with Quickbooks: simply import your Quickbooks data into FieldSurf and you’re up and running. If you own a plumbing service company with more than three plumbing technicians in the field, you owe it yourself to get FieldSurf, automate every aspect of your plumbing business, and bring your business into the 21st century. Just try FieldSurf and you’ll see why it’s considered the best software for plumbing companies — or any other home service company. You won’t be disappointed.